By Willem Oosthoek. Successor volume to the Cugnot Prize award winning Sports Car Racing in the South, 1957-1958 and Sports Car Racing in the South, 1959-1960. The history of sports car racing in the southern United States featuring the top echelon of European sports cars has long been unexplored territory. With the exception of the Sebring 12 Hours, the meets were largely ignored by the national press, and no comprehensive research material is available for the numerous events organized between Texas and Florida, when amateur competition surged in the late 1950s. Yet, the South offers a rich road racing history, often fueled by wealthy oilmen from Texas and Oklahoma. Many of the events were hosted on airport courses where late-model Ferraris, Maseratis, Jaguars, Listers, Porsches, OSCAs and Climax-engined cars such as Lotus, Cooper and Elva did battle with American V8-powered vehicles, such as Corvettes and home-built Specials. This book, the final one in a series of three, offers a race-by-race account of all 1961 and 1962 events in the South, from Novice Races to the concluding Feature competitions. 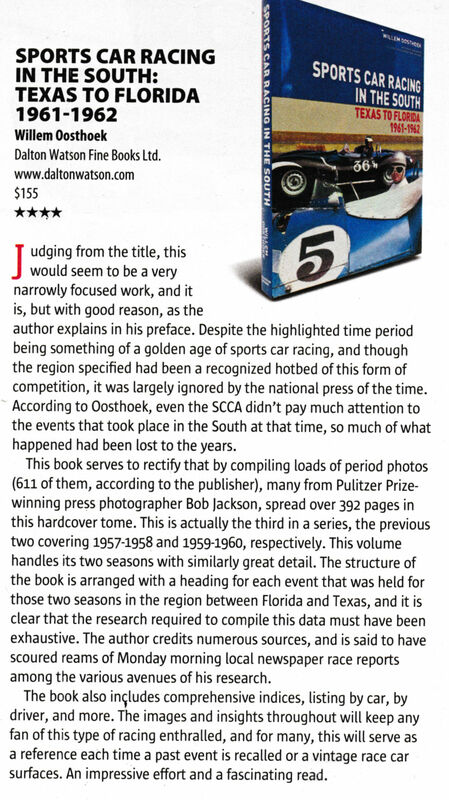 Click here to read an interview about this and other titles with author Willem Oosthoek in Vintage Roadcar magazine. Sports Car Racing In The South: Texas to Florida 1961-1962, has comprehensive indices that detail the individual serial numbers of the cars that raced. Click for the full Ferrari index. it was like being there again. wunnerful.